The transcript below is a real email conversation I had with a patient who was trying to appeal a denied service. Reading this might help you avoid some of the delays we had with the appeal denial process and give you some direction on the steps you need to take if you want to file a claim appeal. The example refers to CPT Code 93880, which is a CIMT test performed at our office and often denied by out-of-state health insurance companies. You can potentially adapt the conversation to any CPT code, service, and price, as the process is very similar for appealing almost any denied service. If you have any questions, please contact Ryan! ME: We just received a denial for your CIMT test from February stating it was a “non-covered service” on your plan. That is the only information we received on our end – would you possibly be able to share the information on your statement with me so I can figure out if there is anything we can do for the appeal denial? Depending on why they determined it to be “non-covered,” we may have a few options available to get it covered. Thanks! PATIENT: How much is it if it isn’t covered? I could dig into it a bit more, but if it’s hundreds of dollars, I’ll be extra motivated. 🙂 Are they usually covered by patients’ coverage? ME: Your EOB from your insurance will probably have more details – I have attached the version I received on my end. Can you see what details yours shows? I’m not sending you an invoice since I think we can get it covered, but I can if that might help. A letter of medical necessity is one of the last options we have for an appeal, so that information should help if we get to that point. Hope it is easier than that, but we’ll see what your EOB says and go from there. Thanks! PATIENT: Still no EOB in the mail. I wonder if I’ll ever get anything. Could we move forward in some other way? ME: Do you possibly have electronic-only EOBs enabled? Can you login to an account with your insurance and look at your claims? PATIENT: Good thoughts. I do have access to my online account and there is an EOB in there! I attached it. There’s not much more in there, unfortunately. What can I do to help this effort? ME: You may need to call them to get a better reason why it was considered non-covered. Sometimes, they just accidentally call it non-covered and as soon as you try to ask them why, it magically gets fixed immediately. The EOB is good to have if we’re filing an appeal, though, so that can be your proof of a denied claim (one of the three things they’ll probably need to initiate an appeal). I know it’s a hassle, but it’s really helpful to have an actual reason why it is non-covered before trying to submit anything just so we don’t run into the same problem after an appeal. Someone at your insurer’s customer service department should be able to answer this question: “Why was CPT Code 93880 considered a non-covered service under my plan?” The process for an appeal denial is pretty much the same no matter what, but we’d give them different content depending on why they claim its non-covered. I hope that helps! PATIENT: Great, thanks Ryan! I’ll give them a call soon and ask that exact question. I’ll be in touch. ME: Just an update to let you know BCBS requested all records related to the CIMT service. I just sent them about 20 pages worth of notes your provider thought were relevant, so we’ll see how they respond in about 4 weeks. You should get a long letter in the mail if it is denied again, or a short letter if they approve it. Your letter usually arrives about 2 weeks before ours, so let me know which you get and I can start fixing the new outcome a little sooner. PATIENT: That’s great! Thank you for staying on top of this, Ryan. I have so much else to do during the day, I’ve been kicking the “call BCBS” can down the road. It sounds like they’re still in the process of determining whether it should be covered. I appreciate it, as always. ME: Have you heard anything yet? I received a appeal denial saying it was duplicate (meaning they didn’t change their mind about it being non-covered) a few weeks ago, but nothing else. Did you happen to get a full explanation of the appeal’s denial? Thanks! PATIENT: Huh… you know, I never received anything more in the mail, and I never checked back up on my dashboard. I’m doing that now…Okay, done looking it up. It does look like I have 2 outstanding claims and I owe ~$200, but that seems lower than I recall it being. Both are for “Vascular Study.” Let me know if there’s any more info I can get you. I should probably pay this dang claim if I haven’t already. ME: That kind of confirms what I got – just hoping for better news from you. I’ll send you an invoice so you can use your flex card to pay the balance. Thanks for the reply! Last year, I wrote a comparison between the three 2017 North Carolina State Health Plan options available to state employees to help people understand the differences between the plans and hopefully make a better decision when selecting a plan for their family. The State Health Plan (NCSHP) makes up our largest group of patients and I know it helped at least one person, so I figured it might be helpful to do the same thing this year. The information in last year’s article is still worth checking out if you are new to health insurance, in general, but this year should be a bit simpler. Because the state eliminated the popular CDHP option for 2018 enrollment, NC state employees are left with only two possible choices: 70/30 and 80/20. The rest of this article will cover the differences between the two plans and identify the types of families that would benefit from each option. I think the NC State Health Plan is one of the best health insurances you can have in North Carolina, so you are already somewhat ahead of the game with either option. However, because the two plans offer different benefit structures, there is usually a “better” choice for everyone. This is a direct, side-by-side comparison of the main financial factors that come in to play with these two health insurance plans. While most people focus on the cost of their monthly premium, that is not the only factor in your yearly healthcare expenses. Sometimes, it makes more sense to pay a higher premium for better coverage if you know that you’re going to need that coverage during the year. Instead of focusing on your premium payment, you should try to minimize your total healthcare expense, which includes your premiums, deductibles, copayments, coinsurances, and other out-of-pocket expenses that you’ll have to pay during the year. There are plenty of exceptions that apply to most situations, but understanding these key terms and aspects of your plan should help you make a reasonable prediction for your costs and set you up to figure out your own unique circumstances. Description: Your monthly premium is the simplest cost you’ll have to calculate. These are your fixed costs and the amounts you’ll be paying regardless of the real healthcare expenses you’ll have during the year. This number is 100% predictable, it does not change, and it is owed every month, no matter what. Meaning: You can consider these numbers to be the “floor” of your annual health expenses. At the very least, if you have health insurance, you will have to pay your premium. If you never went to the doctor at all, you would have to pay at least $300/$7146 each year to be covered under the 70/30 plan. While the $720/month maximum premium seems steep, I would encourage you to try shopping for a plan on the individual marketplace and see exactly what kind of value you’re getting on the plan. The difference will probably be surprising. These premiums are very reasonable when compared with other options, especially considering the quality of the benefits of the plan. Math: The 80/20 plan will save you $30 per visit to a PCP, $30 per visit to an Urgent Care, and $49 per visit to a specialist. Multiply your expected number of visits to each type of provider to figure out how much money you’ll save on your copayments by choosing to upgrade to the 80/20 plan. Meaning: If these plans were sold at a retail store, you might see this advertisement: “Buy $1,080 worth of healthcare and get your next $4,388 in purchases at 70% to 80% off!” After the plans reach their deductibles and coinsurance begins to apply, you’ll pay significantly less for every bill the rest of the year. Because you are paying more for the fixed cost of the higher premium, you’ll need to incur at least $1,700 in expenses AFTER you have reached your deductible before the 80/20 plan eventually catches back up with the 70/30 plan for total expected expenses. 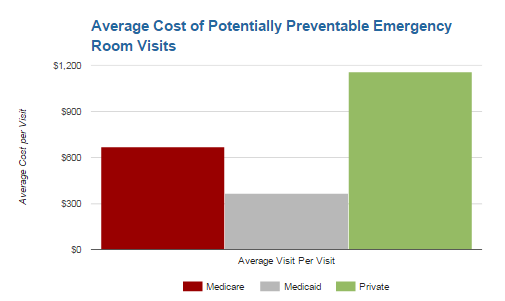 A decent estimate for visit costs would be $100 for a PCP visit, $200 for an Urgent Care visit, $300 for a Specialist visit, $500 for a MRI/CT, $2000 for an outpatient ER visit, and $5000 for an inpatient ER visit, per day. The 80/20 plan will save you 10% after your deductible, so you can add up the totals for however many of those services you’re expecting to use and discount 10% for the 80/20 plan to calculate your total savings. On the 80/20 State Health Plan plan, there is an “out-of-pocket maximum” of $6,850 for an individual and $14,300 for a family. This is the total amount of money, not including your premiums, that you would possibly ever have to pay for your healthcare in a single year. Even if you were in the hospital from January to December, this is the most you’d have to pay on the 80/20 plan (see assumptions). However, on the 70/30 State Health Plan, there is no “out-of-pocket maximum.” Instead, the 70/30 plan has a cap on the “coinsurance maximum” at a $4,388 / $13,164 rate. Since we just covered how both plans have a deductible and the coinsurance applies to expenses after the deductible, you would think these would just be interchangeable terms. In a kind of sneaky way, this is slipped in as the biggest single category of expense for people who do end up meeting their maximums. Why? Basically, you can interpret this to mean that the 80/20 plan only has a $5,600 “after deductible” coinsurance maximum that includes pharmacy benefits, while the 70/30 plan has a $1,080 medical deductible, $3,360 pharmacy deductible, and $4,388 coinsurance maximum separately. While the final out-of-pocket expenses are similar, the methods they each use to get there accumulate at different rates. Depending on where you fall on your expected usage, one side could still make a substantial difference. Look up every medication on your formulary. This is the document where you can find your drug’s “tier,” a hierarchical cost-based categorization system that your insurer uses to decide how much you’ll pay for each drug. If you cannot find the drug, you will need to contact your insurer directly to ask about a more specific medication than they have listed in the general formulary. Estimate retail value for over-the-counter medications. This information should give you a good starting point for predicting your coverage, but it is not comprehensive. These are other categories of health expenses that you need to be aware of and factor in to your own personal calculations when deciding on one of the State Health Plan options. Out-of-network expenses. 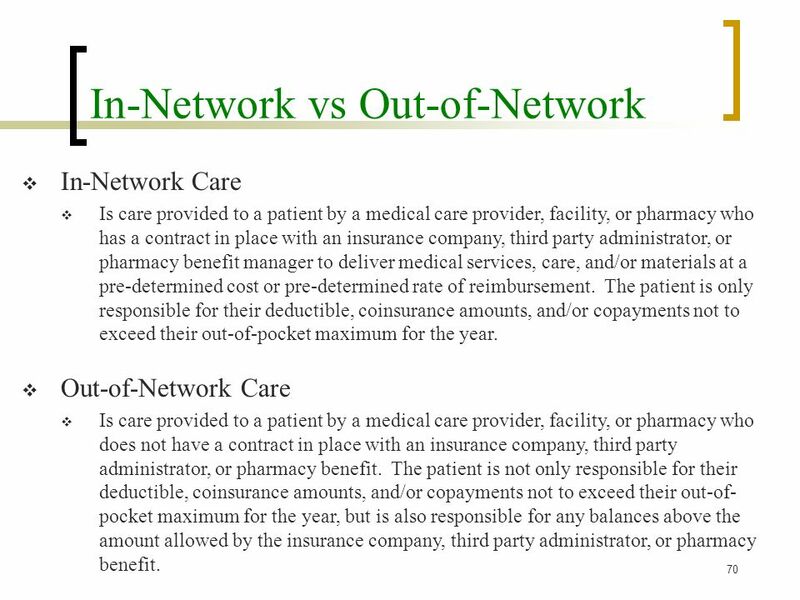 Visits to an out-of-network provider are “covered” under a separate set of State Health Plan benefits from your in-network out-of-pocket expenses. These benefits are usually at least 50% worse and there are a lot more things that are denied or non-covered, so it is best to stay in-network for almost anything you do. Unexpected Expenses. You might get lucky, but remember that you are trying to predict 2018 health expenses for your entire family in October 2017. Things can change in the next hour, much less 2-14 months from now. If you choose the 70/30 plan, figure out how comfortable you are with having an accident and meeting the maximum, then consider that additional risk when selecting a plan. The state removed the “Free” Annual Wellness Visit from the State Health Plan 70/30 benefits, so your annual physical will have a $40 copayment just like any other visit. Last year, this visit to cover recommended preventive screenings and testing was covered 100% for all plans. The 70/30 doesn’t cover ACA Preventive Medicines, either. I am unsure how that law is being implemented or supported right now, but basically you should just expect to pay more for birth control with the 70/30 plan, especially for branded medications. Emergency room copayments are only a $37 difference, but the big part is in the 20% vs. 30% coinsurance owed. A 10% difference in the bill from a single ER visit adds up quickly, so you should really expect to pay at least $500-$1000 more for a single night’s ER stay with the 70/30 plan in you have not yet met your deductible. Your coinsurance kicks in sooner under the 70/30 plan ($170/$510 sooner for an individual/family plan), but your coinsurance rate is slightly worse. Because the 80/20 State Health Plan “catches up” with the 70/30 at a 10% rate, it would take $1,700/$5,100 in additional health expenses under each plan to reach a break-even point where you’ve paid the same amount in “deductible + coinsurance” under either plan. If most of your health expenses come from prescriptions, the 80/20 plan will save you $860 between the $2,500 and $3,360 level. However, the advantage changes if you have more than one person in your family with high cost prescriptions. Under the 70/30 plan, the individual and family have the same $3,360 deductible, while the 80/20 plan has a $4,000 family maximum. If more than one person expects to spend ~$2,000 or more on prescriptions, the 70/30 plan will save you an extra $640 on those medications. Complete the Tobacco Attestation Credit. Even if you did it last year, you need to do it again. This saves you $60/month on your State Health Plan premium under every option. As with everything in healthcare, the standard “subject to individual determination” disclaimers always apply and nobody will, or should, give you a definite answer. My wife is a state employee and I am making this same decision for my family, so you can consider this my way of talking out the decision for myself. I cannot tell you which plan you should choose, but I think you can use this guide to make that decision on your own. All you can do is make the best estimate possible with the information you have at the time. Someone telling you they can precisely predict your actual health expenses is either lying, inexperienced, or delusional. Be ready to adjust if something does happen with your health and you need more extensive care than planned. Factor that potential into your decision and always be prepared for the worst-case scenario. I’ve found it is always better to be relieved things weren’t as bad as you thought, rather than being mad that they were worse. How do I know if I am being billed the correct amount for my visit? As most people can understand, figuring out exactly how much a particular medical service will cost can be extremely difficult. There are a lot of variables that factor in to the final cost of any care you receive, but it is still possible to get pretty solid information and set reasonable expectations for the most common types of services you will encounter. This post is designed to help you understand the basics of the billing process to help you identify any problems and know learn how to fix them. When you are billed by any medical provider, they are usually working with the best possible information they can get about your insurance coverage at the time of service. However, regardless of how well they might be able to predict your coverage, providers are often still sometimes just as surprised as the patient when dealing with unexpected changes in coverage and quirks with different insurance plans. Because of this uncertainty, the amount you pay at the time of service may differ from the amount you actually owe. No matter how much your provider may try to help navigate your insurance policy, the ultimate responsibility for the balance of a denied claim belongs to the patient. The total amount you will owe is called “patient responsibility” because you’re the one who will have to pay the bill and ultimately responsible for ensuring that you are paying the correct amount. Billing errors aren’t common, but they do happen and can be fixed pretty easily if you know how to find them. There are three things that you’ll need to keep track of to know for sure if you are being billed the correct amount by your provider. The amount you paid at the time of service. The amount your explanation of benefits stated you would owe. The amount of the bill you receive from your provider. Ideally, #1 and #2 are equal and #3 never happens because you’ve already paid the correct amount for the service you’ve received after the appointment. For standard visits and simple insurance plans with copayments instead of deductibles, this is usually pretty easy. Your insurance says you’ll owe $25 for a visit, so you’ll pay your $25 when you check out and know that the rest will be covered. Easy. Unfortunately, there are far more instances where deductibles, co-insurances, exclusions, and other insurance hurdles will also apply to your benefits and make things more difficult to predict. 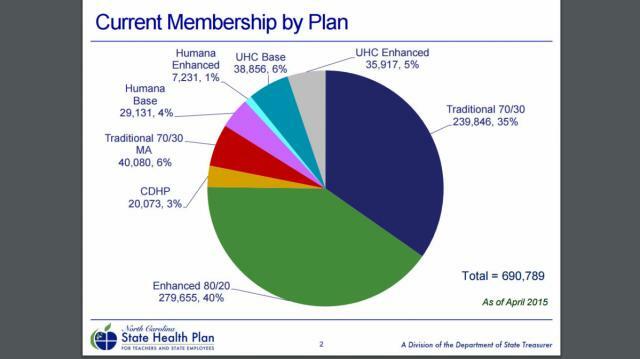 These types of “high deductible / shared percentage” plans are becoming much more common and make up all of the possible options available on the health exchange for Durham County in 2017. Because the total bills you’ll receive for these kind of plans are very much dependent on factors that you can’t guarantee before the service is rendered, the amounts you are charged for certain services are much more unpredictable. #1. Remember what you paid. Because most FSA plans now allow you to submit an electronic PDF of your receipts for tax purposes, you probably don’t need to save a real paper receipt of your transaction. However, you will still need to keep track of how much you’ve paid, just like any other bill you might have. You can also always refer back to your credit card statement or look at your online banking history to reference the charges, if needed. Either way, if you actually get a bill, you’ll want to look up previous payments towards your expected out-of-pocket expenses for that service and make sure they are already deducted from your total balance. #2. Check your Explanation of Benefits (EOB). This is a statement issued by your insurance company and either mailed or uploaded to your online member services account about 2-3 weeks after every claim filed on your behalf by a medical provider or facility. Your final out-of-pocket expenses are usually listed under a column titled “total patient responsibility” and will your insurer’s reasoning for each balance owed will be detailed on this document after your insurance benefits have been assigned to your claim. If you receive a bill because your insurer says your plan didn’t pay for something, this document will tell you why. If you know what you’ve paid (shown on your receipt) and how much you should owe (based on your EOB), you can pretty much figure out how much you’ll be billed after the service. There are always exceptions at each facility you visit that may lead to separate fees associated with their services, but those are usually relatively minor compared to the total cost of care. If you think there is a problem with the amount you are being billed, be sure to contact your provider and double check to see if there are any other fees or balances that may have contributed to the difference before attempting to contact your insurance. So, you’ve looked at your EOB and examined at your bill and the two numbers still don’t match up. Or, worse, they do matchup and the amount is significantly higher than you were expecting. Now that you have identified a potential discrepancy with the bill, what do you do about it? Your first phone call depends on where you find the problem. My EOB and the bill from my provider both show the same amount due. This is a problem between you and your insurer. In this case, the problem would be that you disagree with the amount your insurer said you would owe since your provider’s information matches the insurer. This means that the problem lies at the start of the claim process where your insurance assigned your plan’s benefits to the claim they received. You thought you would owe one thing, but your insurance said something else. On your EOB, look up the “Remark Code” for the line items that are being denied. These are generally 2 or 3 digit alphanumeric codes that reference a longer explanation of denial later on in the document. This is a summary of the actual reason your insurance is using to deny this charge. If this summary explanation does not make sense to you based on how you understand your policy, you can call your insurance company for a full explanation. When you call customer service, be sure to have your insurance card and EOB in front of you so you can reference the date of service, amount billed, and the specific line item that you are questioning. They will be able to look up your insurance policy and re-examine the specific claim you are referencing at the same time to make sure your plan’s benefits were applied correctly. If your benefits were applied correctly, the representative can answer questions about your plan and help you understand how your benefits will be applied in the future so you can possibly avoid the same situation next time. Sometimes, payment is denied because they need to update information about your insurance plan, so you can answer their questions over the phone and take care of the balance in just a couple minutes. Learning more about your policy and how your insurance will process a similar claim could make a big difference in the long run. If your benefits were not applied correctly, the customer service representative should be able to notice the mistake and submit your claim for reprocessing. If this happens to be the case, you’ll want to get a reference number for the call and notify the provider that sent you a bill. The insurance will likely give you a quote like “we will reprocess this claim and send a corrected claim to your provider in 2-3 weeks.” Whenever they give you a timeframe, double it and then call your provider back to see if everything has been resolved. My EOB says one amount owed, but the provider’s bill says something different. You owed money for another claim. Most of the time, your billing statement only includes claim details for the claims with a balance owed. It is possible that your provider applied part of a payment you’d made to a claim that is not currently on your billing statement because that balance was covered. You paid $100 at the time of service, but $40 went towards a balance from January and $60 went towards a balance from April. Because you also owed $100 from the April visit, you may receive a bill for $40 for that claim even though you paid $100 already. You owed money for additional fees and services not on the bill. Every practice is different, but there are always additional fees that you may have to pay for services that are not reimbursable by insurance companies. These include charges for things like missed appointments, form completion, records requests, and certain lab tests that aren’t covered by insurances. Part of a payment you made may have been applied to one of these types of charges. You had a previous credit applied. Sometimes, the system actually works in your favor and you might overpay for a charge up front. When this happens, you’ll receive a credit on your account that may be applied to future balances and reduce the amount you are charged at the time of service. If you were unaware of the credit, you may have expected a service to be cheaper than you thought when you paid. You overpaid by $20 a couple months ago, so your provider only charged you $5 for your usual $25 copayment. When you look at your EOB, it shows that you would owe $25 for that visit, even if you only paid $5 that day. There was a mistake. Most financial correspondence between your insurer and provider is electronic and automated, but that doesn’t mean there aren’t mistakes. As the provider, we receive batches of claim data that includes dozens of claim rows and about 20 columns of payment information per claim from the insurer and we have to sift through every row, column, and number to ensure its accuracy. As you can imagine, it is very tough to get through this process and end up 100% perfect. Even at 99.9% accuracy, that means an average primary care facility will generate about 10 incorrect patient balances per month. Before getting upset or worried about the possibility of owing for a service, have your provider double check the claim first before attempting to appeal through your insurer. You can easily identify which one of these situations is likely to apply to you by asking for a “transactional summary” of all your claims for a certain time period. All providers may call this report something different, so you’ll just need to ask for something that shows all the charges on all claims filed by the provider and how all of your payments were applied to your account over a certain time period. This will let you see, line by line, what caused the problem. Most of the time, any changes to a bill with an amount that differs from your EOB will always be initiated by the provider who performed the service, so it’s best to start at the source if you want to fix a potential problem. I hope this has given you the knowledge to better understand your medical bills and the confidence to discuss them with your provider, if needed. If you have any questions related to the content of this article or if you’ve experienced any other type of situation that I didn’t address, I’d love to read your comments below. Thanks for reading! To help all of the State employees of North Carolina figure out which version of the State Health Plan would be best for them during the upcoming year, I thought we would attempt to review the differences between the three options – CDHP (85/15), Enhanced 80/20, and Traditional 70/30. The State has developed a very informative site with lots of details and specifics for the State Health Plan, so I won’t repeat anything you can find there. The goal of this post is to compare, line by line, what the numbers associated with each plan mean and which types of medical situations end up being the preferred option financially for each person once all expenses have been considered. All State Employees should have received a “Decision Guide for Open Enrollment” packet from their insurer for the 2017 benefit period sometime in the past few weeks. You can use the “2017 State Health Plan Comparison” table on Page 8 in this booklet, or you can click on this link to get the PDF online. Here we go! HRA Starting Balance: You’ll notice that the CDHP plan is the only option with an Health Reimbursement Account (HRA). An HRA is basically a fund that your employer sets aside to pay for your qualifying medical expenses. With the CDHP plan, an individual has their first $600 in health expenses paid through their employer’s HRA. This is basically free money, as long as you need it and use it for things that are approved by your plan (eg. doctor’s visits, most prescriptions). Effectively, this splits the CDHP’s $1,500 deductible into two different periods, where you end up only having to pay once you hit $601 in expenses each year. One thing to consider is that you actually need to use $600 in health expenses for this aspect of the plan to help. If you don’t use it, the $600 set aside for you in your employer’s account usually resets and lets the employer keep any unused funds to help reduce expenses the following year. While $600 is the same to anyone, this is an especially nice feature for people who expect their total health expenses to be less than $600 per year because they’ll never have to pay anything except their premiums. The CDHP plan applies all medical expenses to the deductible. Your sick visits, specialist appointments, prescriptions – everything goes towards your initial $1,500 deductible. Other than the covered ACA Preventive Services, this plan doesn’t pay any of your health care expenses until after you have met the deductible. The 80/20 and 70/30 plan have co-payments for PCP visits, urgent cares, and prescriptions so the deductible only applies to things like surgeries, labs, and hospital visits. While the deductibles are lower, they are also less likely to be met because they only apply to certain things. Co-Insurance: You might notice that the co-insurance rate is also indicative of the name of the plan – eg. the 80/20 plan features a 20% co-insurance. The co-insurance is a percentage that requires the patient to pay a certain portion of approved medical services once their deductibles have been met. Basically, as a reward for paying 100% of everything out-of-pocket before you met the deductible, your insurance will now start helping pay your health expenses by reducing your portion to either 15%, 20%, or 30%, depending on the plan. Once you have met your deductible, this is the percentage of your health expenses you will be required to pay until you have met your co-insurance maximum. Medical Co-Insurance Maximum: The 70/30 plan is the only one that has a medical co-insurance maximum. The other plans have their own maximums, so while this seems like a small bit of semantics, but it actually makes a pretty big difference in your possible expenses. The CDHP only has a combined out-of-pocket maximum that includes co-insurance and pharmacy benefits, while the 80/20 plan skips the co-insurance maximum and separates the out-of-pocket maximums between medical and pharmacy. By calling it a “co-insurance maximum” and not a “out-of-pocket maximum,” this number does not include the annual deductible that has already been paid. This graphic does not include the separate prescription deductibles associated with the 80/20 and 70/30 plans. Because the $4,350 out-of-pocket maximum in the 80/20 plan includes the $1,250 deductible, the 80/20 plan’s effective “co-insurance maximum” is really only $3,100. With the 70/30 plan, you’ll be paying the $1,080 deductible PLUS $4,388 more. A small difference, but one that costs over $1,200 if it actually comes into play. Also, it is important to remember that the 80/20 and 70/30 plans have separate deductibles for prescriptions, which we will get into soon. Medical Out-of Pocket Maximum: As mentioned in the previous paragraph, the medical out-of-pocket maximum includes all out-of-pocket expenses a person would have to pay for medical services each year. This includes co-payments, co-insurances, and deductibles. For the 80/20 plan, this means you’ll have a cap on your medical expenses each year of $4,350. Because this number includes the deductible, you’ll basically be paying a $1,250 deductible, and then +20% of the next $15,500 in health expenses you incur (for a total of $4,350). This number puts a cap on your total annual medical expenses, so you can consider this the limit of a “worst case” scenario (not including prescription coverage). Pharmacy Out-of Pocket Maximum: This is just like the medical out-of-pocket maximum described above, but only for prescriptions. 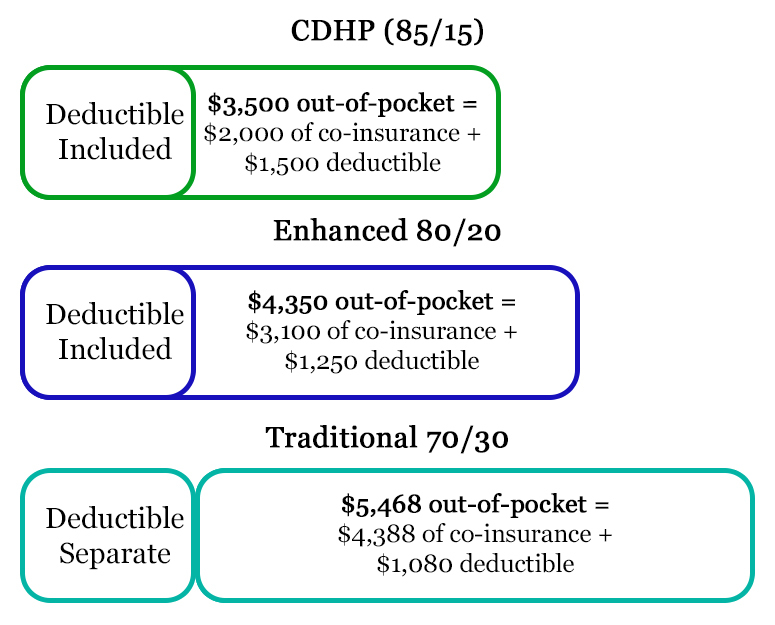 The 80/20 plan and 70/30 plan both have separate deductibles for prescriptions, while the CDHP plan assigns both medical and pharmacy claims towards the same deductible. This makes it seem like the CDHP plan has better prescription coverage than the 80/20 or 70/30 plan, but those two only apply their deductibles to high tiered prescriptions that aren’t used by very many people. With the 80/20 and 70/30 plans, most of your prescriptions will be a set price for a 30- or 90-day supply, so most people will never really get close to meeting their limits with simple $5 and $30 co-payments per month. 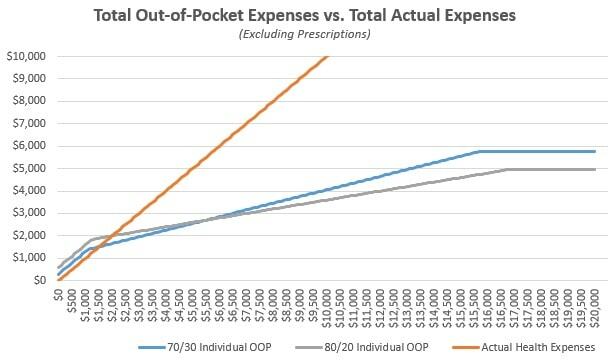 Out-of-Pocket Maximum (Combined Medical and Pharmacy): The basic concept was covered in the previous two sections, but this number represents the “worst case scenario” for all of your out-of-pocket health expenses combined. There is no scenario where an individual will have to pay more than $3,500 on the CDHP plan, $6,850 on the 80/20 plan, or $8,828 on the 70/30 plan. This is a helpful number to know if you’re going to need a major surgery or hospitalization. These numbers are relatively low compared to today’s health insurance environment, where standard maximums are usually around $10,000 or $15,000 annually, so this is a one of the best aspects of the State Health Plan and a major selling point for most people. ACA Preventive Services: These are the rates for certain services that have been categorized as “preventive” by stipulations in the Affordable Care Act, which has been adopted by the State Health Plan. You can check out the details of what is considered a preventive service on the State’s website – this includes things like your annual wellness exam, most vaccinations, and standard age-based guidelines and screenings. Preventive medicine has been proven to keep people healthier, so insurer’s are making a big push to ensure all of their members get these basic, cost-effective primary care services now so they can avoid having to pay for complicated, expensive hospital visits later. Because the services are preventive, and not urgent, the insurance penalizes you significantly for receiving these services out-of-network, so make sure the provider you see accepts your insurance if you want to receive these benefits. Office Visits: So far, everything has basically seemed most favorable to the CDHP 85/15 plan. The next few topics are where the real benefits of the 80/20 and 70/30 plans come in, since they have co-payments for most medical services, instead of a deductible. While their deductible may be higher, it also applies to fewer things that you are likely to need. This is also the part of your benefits that applies to appointments at Family Care, if you were wondering. For example, consider a single primary care visit for the flu – to make it easy, we’ll say its your first visit of the year. With the CDHP plan, you are paying 100% of the cost of the visit because you haven’t met your deductible yet. This includes the doctor’s visit, flu testing, lab work, prescriptions, and any other services you may need. However, if the visit falls within the first $600 of your annual health expenses, the charges would be paid by your HRA account and you would not owe anything out-of-pocket. You would also get $25 added to your HRA, so you can think of that like a cash-back rebate towards your health expenses for using an in-network provider. After your HRA has been exhausted for the year, you will owe 100% of every office visit you have for the next $900, and 15% after that until you reach your maximum. With the 80/20 plan, you would only pay a $25 co-payment for a doctor’s office visit, rather than having the charges applied to your deductible and owing 100%. Basically, you would save about $75 every time you went to a PCP and $215 every time you went to a specialist. If you had any testing or additional services (eg. flu test, breathing treatment, etc. 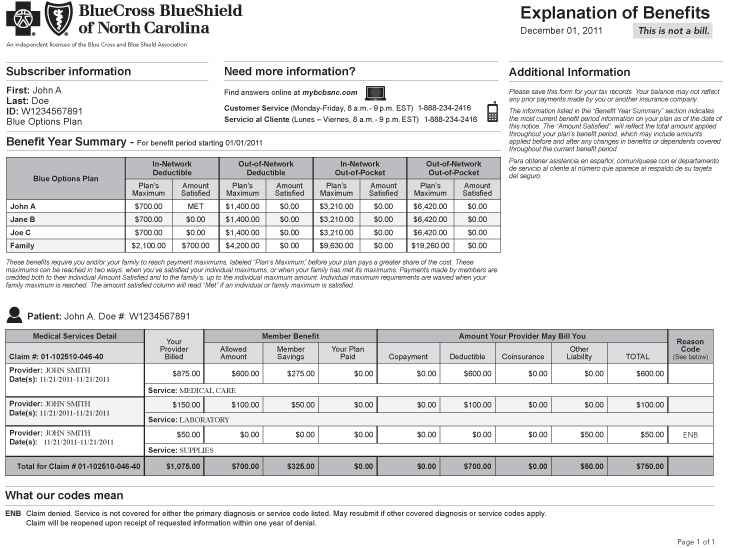 ), your deductible would apply in addition to your co-payment. This makes things relatively simple and helps people budget costs once they expect to have several office visits each year. The 70/30 plan has the highest co-payments, but they are still not too far off from the 80/20 plan and the deductible applies to PCP visits the same way. You will have a higher co-payment, but still pay the same rates for additional services towards your deductible. Urgent Care: Just like the section on Office Visits, but in an Urgent Care setting. There isn’t too much different about the basic process from office visits, so the main thing to notice is how much higher your expenses will be at an urgent care vs. your primary care provider. Whenever possible, you should always try to visit your primary care provider before attempting to go to an urgent care. For example, at this great independent primary care facility known as Family Care, we can guarantee either same-day or next-day appointments, so we can help you avoid the higher costs and lower quality of service that you’re bound to experience at an urgent care facility. The nice thing is that the benefits for urgent care visits are identical at both in-network and out-of-network providers. Because the problem you are experiencing is obviously “urgent” if you are visiting an urgent care, your insurance company won’t care about the network and allow you to get treated wherever is most convenient. They charge a steep fee for this convenience, but it is still nice to know you won’t be charged more because of the network. Emergency Room: Again, the CDHP plan applies charges to a deductible, while the 80/20 and 70/30 plan have co-payments associated with the visits. Depending on the significance of your reason for visiting the ER and how close you are to meeting your deductible, either one might be considered the best option for your situation. The one, and probably only, benefit to an ER visit is that you’ll likely go well beyond your entire out-of-pocket in just a few hours, so your healthcare will basically be “free” for the rest of the year. Yay for you! Inpatient Hospital: This is reserved for actual hospital stays where the patient is admitted and kept in the hospital for some period of time. With all of the plans, you’ll only end up receiving the benefits in this row if you visit the ER and are then later admitted to the hospital. The insurance does not try to charge you twice after an admission, so the bump from an ER visit to an admission is not too drastic. The CDHP and 80/20 plans have an option to either get money back or have their co-payments waived if you visit a Blue Options Designated Hospital, so you should try to visit a preferred hospital whenever possible. Prescription Coverage: The concept of tiers is pretty complicated, so I will go over this part in a separate post. However, the basics are still pretty much as the regular medical benefits the same across the three options. The CDHP has prescriptions applied to the same deductible as everything else, while the 80/20 and 70/30 plans have co-payments associated with different tiers of drugs. If you aren’t sure what these terms really mean, here is a good 2.5 minute video on what a drug formulary is and why your insurance has grouped different drugs into tiers. For the State Health Plan, specifically, here are the links to the specific formulary for each plan. You should look up the medications you take to determine what tier they are classified under so you can get a good idea of your expected costs for that drug. The formulary changes all the time and the difference between a Tier 1 drug and a Tier 2 drug could be hundreds of dollars per year, so this helps keep you from being surprised when you show up at the pharmacy. In my opinion, the State Health Plan is the best health insurance to have in North Carolina. Each plan has their specific benefits and drawbacks, but they are all significantly better insurance plans than the plans you’re likely to find available on Healthcare.gov. The problem is finding the plan that makes the most sense for how it will actually be used by you and your family. Every medical situation is unique, but here are some of the pros and cons of each plan to might help you make your final decision. Cons: You are required to pay for 100% of your expenses between $600 and $1,500 each year. You’ll have to pay for prescriptions under the same deductible as medical expenses. You’ll need to take additional steps to set up your HRA with your employer. Pros: Lowest co-payments for PCP and Urgent Care visits, as well as most prescriptions. Pharmacy deductible is only $2,500, so meeting that deductible could help reduce overall costs if prescriptions make up a large percentage of your medical expenses. Cons: Requires at least $15 per month, minimum, in premiums and has the highest premium cost to add family members. Potentially has the highest cost in a situation where multiple family members need extensive care and prescription coverage. Pros: Has a lower premium than the 80/20, but still maintains a similar structure for PCP and urgent care visits. Has co-payments for Tier 3 medications, so certain medications might be cheaper than the other plans. One prescription deductible applies to the entire family. 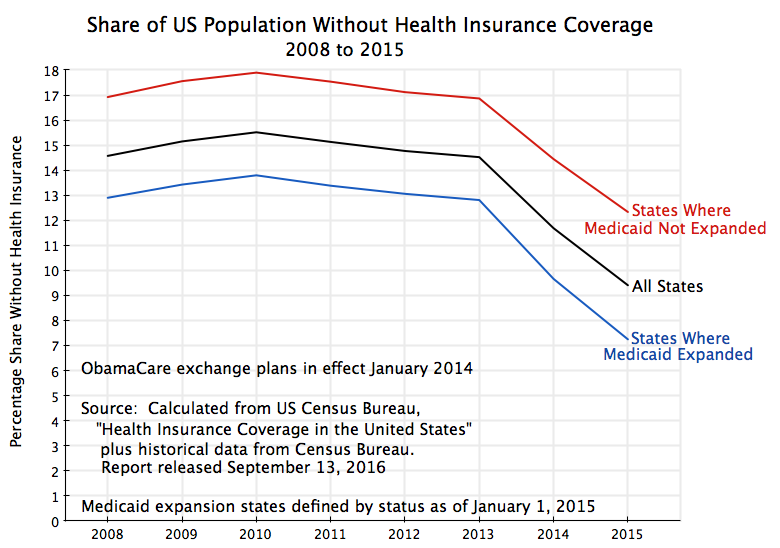 Cons: Has the worst coverage after the deductible has been met of the three plans. Because the premium is similar to the CDHP, while the coverage is similar to the 80/20 plan, the segment of people that would have the best coverage for their unique situations is fairly narrow. Most people would be better off getting the CDHP or 80/20, but there is a definite middle group where this plan makes the most sense. I hope this was a helpful breakdown of the major components of these three plans. For more details on how you should think about this information, in general, be sure to check out our recent post on the 3 things you should consider when signing up for health insurance. If you have any questions, please submit them in the comments and I’ll be sure to reply. Thanks for reading! The problem that most people have with their health insurance plan is rarely with the actual coverage – people are generally only upset when their plan doesn’t cover something they thought it would or when they are surprised by some costly detail that wasn’t made clear at enrollment. Insurance companies don’t do the best job of educating patients on the actual details of the plans they are selling, but the information you need to know to set proper expectations is available if you know where to look. You’ll have to do some work and learn some pretty boring things, but you are the one who ultimately has to understand the details of your plan’s coverage, not your insurer. The point of this article is to help you understand the crucial differences between possible plans and help you feel comfortable with the coverage you choose. The entire concept of health insurance is that you are basically making a bet on your health. The healthier you are, the less likely you are to use your insurance for high cost medical services. Your insurance company knows this and sets their prices accordingly. If the insurance company thinks you are going to cost $5,000 to cover this year, their goal is to set your total premiums and out-of-pocket expenses to more than $5,000 so they can make a profit. This is the bet – who will get the better deal once all of your medical expenses have been paid? The benefit structure of every plan offered by insurers is carefully calculated to give them the best chance of winning this bet. By understanding how your insurance plan works, you can put the odds back in your favor and make every dollar you have to spend on healthcare go much further. Cost – How much will I pay in out-of-pocket expenses? Coverage – What services and medications will I have access to under my plan? Network – Is my provider “in-network” with my insurance plan? Each component is equally important and can have critical implications on the others. While it is almost impossible to get your expected costs 100% right before things actually happen, just having a very good estimate will help you budget accordingly and avoid surprises when you seek medical care. If you need help with this calculation, our Health Insurance Cost Estimator Tool should help give you a good estimate. I hope the following pages will help you fully understand the benefits, and consequences, of your choices when you’re deciding between two possible plans. Continue reading to go into further detail on each one of these components. The most popular way to think about the cost of your health insurance plan is to focus on the monthly premium. This sounds good because you know the fixed costs associated with your plan and can seemingly predict exactly how much you will have to spend for coverage. However, this line of thinking leaves out the most important part by ignoring the variable costs a person might incur each year when they actually use their health insurance and visit their doctor. To get a complete picture, you should compare a plan’s total expected out-of-pocket expenses, which factor in the possible copayments, coinsurances, and deductibles that you might have to pay for during the year in addition to your premiums. Signing up for insurance and paying your premiums to your insurer is not the only out-of-pocket expense you should expect if you need medical care. Much like car loan payments don’t cover the cost of the gas you need to put in the car, different health insurance plans might require significantly more “gas” than others if you actually want to take your plan out for a drive. There are two primary things to consider when comparing the cost of two different plans – how much you’ll actually use your insurance, and how much you’ll have to pay in a “worst case scenario.” It is also important to remember that the out-of-pocket maximum does not include premium payments. Here is a quick plan comparison as an example. Plan A: Higher Premium, Lower Out-of-PocketIf you have some chronic conditions that require frequent visits to specialists and take some high priced medicines, it will probably end up being cheaper to pay a higher premium for better coverage. Since you’ll be using the insurance often, it is comforting to know you’ll have a low limit on out-of-pocket costs when you actually need care. However, if you don’t end up using your insurance as much as you thought, you’ll be paying significantly more for unnecessary coverage. Plan B: Lower Premium, Higher Out-of-PocketIf you are relatively healthy and rarely visit the doctor, a cheap premium with a high deductible makes sense because you want the lowest fixed costs possible. By not seeking medical care often, you can be pretty sure your variable costs will be low. You leave yourself more vulnerable to higher costs if something bad were to happen, like an unexpected emergency room visit or hospital admission, but that is a part of the bet you’re placing on your care. Now to the fun part – Charts! Woo! This chart compares the total cost of the healthcare you need with the total out-of-pocket expenses incurred if you were covered under either Plan A and Plan B. 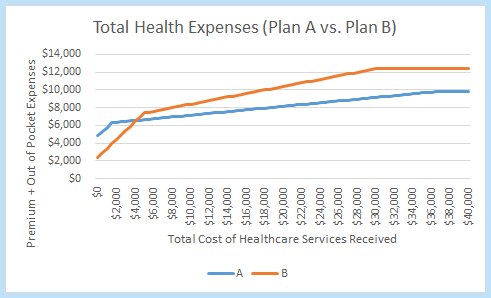 Because Plan A has a higher premium, the fixed cost of this plan has a higher floor than Plan B. If you don’t actually need to use the insurance, you will save money by choosing Plan B. 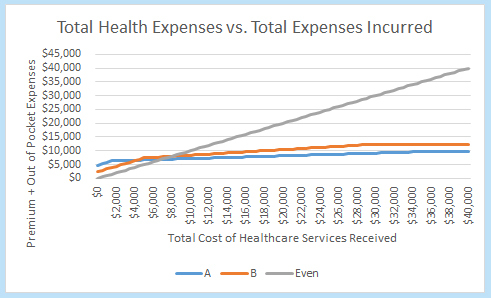 The turning point occurs when the two lines intersect, which in this comparison is just over $4,000 in total health expenses. At that point, you’ll be saving money by choosing Plan A, even though the premiums will be more expensive. Remember that “bet” we talked about earlier between you and your insurance company for who has to pay more of your healthcare expenses? 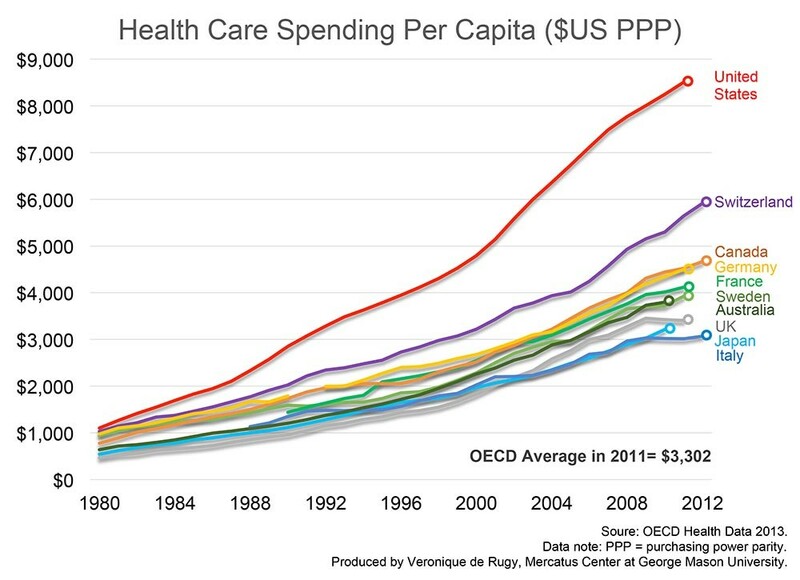 The grey line represents the actual expense incurred to keep you healthy. As you can tell, the insurer is hoping they have enough members incur less than about $7,500 in health expenses each year to pay for the few members who will be extremely expensive to cover. The insurance wants to move that break-even point as far to the right of the chart as possible, while you’re hoping to intersect with their line as close to the left as possible. Because it is impossible to predict the future and know exactly what services you’ll need, the best way to look at something like this is in terms of a “Best Case” / “Worst Case” scenario. In a “Best Case” Scenario, where this person is perfectly healthy and never uses their insurance plan at all, Plan A will be twice as expensive as Plan B ($4,800 vs. $2,400) because the premiums are guaranteed payments regardless of how often you use your insurance plan. 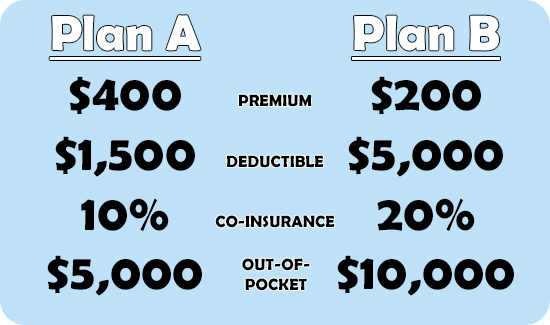 Plan A will actually still be more expensive than Plan B, overall, all the way up to the first $4,000 in out-of-pocket expenses. If you are unlikely to have at least $4,000 or more in annual health expenses, it makes sense to pay a lower premium and pay more of your own out-of-pocket expenses. Plan B would be a better choice as long as your expenses were lower than $4,000 during the year. In a “Worst Case” Scenario, where this person ends up in the hospital for at least a few days and racks up $50,000+ in medical expenses, Plan B will be up to $2,600 more expensive because there is a higher deductible and out-of-pocket maximum limitation. The ACA put a cap on the out-of-pocket maximum that a patient would have to pay in such a situation, so the out-of-pocket maximum helps provide a safety net to ensure people don’t go bankrupt due to a medical emergency. In this case, Plan A would have better coverage. These are overly simplified examples, but it shows how the total cost of healthcare for an individual can vary greatly just based on the type of plan they choose. Most likely, you will fall somewhere in the middle of the “Best Case” / “Worst Case” spectrum. The goal is to guess how close you are to one side or the other and how likely it is that you’ll need a high cost service during the year. You obviously can’t plan on having a serious accident, but the closer you get to that tipping point between the two plans, the more you might want to consider increasing your coverage to feel a little more comfortable with your financial risk in such a situation. Check out our Health Insurance Cost Estimator Tool to help you estimate your anticipated annual costs. There are several different ways to define “Coverage” when you’re referring to the details of an insurance plan, but this section will focus on the specific procedures, treatments, and prescriptions that your health insurance plan will approve. Basically, if you have a problem and you sign up for an insurance plan, you want to make sure that specific problem is something that falls under the benefits outlined in your plan. The majority of what is required to be covered by insurances is either mandated by the Affordable Cart Act or derived from basic Medicare standards, so most of coverage details for medical services are the same across the major commercial insurers. But, that doesn’t mean they are all the same, either. Standard medical services like doctor’s visits, generic medications, and vaccines, will be accepted on almost any plan. However, if you are planning to do non-standard things, like cosmetic surgeries, treatment for rare or complex diagnoses, or special blood testing, you should really try to dig a little deeper into the plan to see what types of services are actually covered. Essentially, the best way to think about how to get the “best” coverage you need is to start by seeking coverage for your most expensive service. Call your providers and ask for a price quote for certain types of visits you expect to incur during the benefit year. You will probably never get a definite answer (for a variety of really good reasons that we’ll answer in another post), but you should be able to get a ballpark idea what kind of prices you can expect. Ask for the specific CPT Codes that will be used for your procedures so you can tell your insurer exactly what you want to verify. Then, figure out which insurance plan covers the services that would cost the most if you didn’t have coverage because they will make the biggest difference in your bottom line for out-of-pocket expenses. Here is a simplified chart that helps you visualize the types of priorities you should be making when selecting coverage. These are just working estimates and are by no means exact, especially considering that we just spent 1,000 words earlier in this article talking about how the “Cost If Covered” part of the equation could vary drastically depending on your plan. The point is to get a sense of the risk involved in having, or not having, coverage for a particular service. Obviously, having coverage for the ER visits would be Priority #1 in this scenario. A single accident with no coverage could be financially devastating. But, those are generally few and far between for most people. Again, this goes back to the concept of placing a bet on your health expenses. You should go down the list of your expected health costs and find a plan that will pay for all of your highest priced items first, since they will have the biggest net difference on your potential bottom line. After all, what would be worse? Having to pay an extra $75 because a PCP visit was denied, or having to pay an extra $45,000 because your hospital visit was denied? A PCP visit is more likely to occur, but the one time the hospital visit gets denied will potentially be the most devastating. However, because denials are still not too common if you have insurance, the most common factor that comes up when differentiating plans based on their overall coverage relates to prescriptions, as they can vary greatly depending on the plan. One plan could offer a certain drug at a $10 copay, while another plan might not cover it at all and either cost you $200 out-of-pocket or force you to switch to a different medication that your insurance prefers. Neither option is ideal, as you’re ultimately either poorer or sicker if your medication isn’t covered by your insurance. The insurers structure their drug coverage decisions based on the population of their insured, so finding the plan that best suits your patient profile could make a big difference in prescription costs. So, how do you find out which drugs are covered on which plan? To be confident in your choice, you should learn the details of the prospective plan’s drug formulary. Most of the time, a simple Google search with “Name of Insurance Plan, Drug Formulary List” in the search box will direct you to a PDF of the plan’s details. If not, there should a link on the insurance provider’s website or a phone number you can call to request a copy by mail or email. Prescriptions are one of the few health expenses you can make an accurate budget for up front, so it is important to know how your plan will cover the medications you are currently taking. If you think your medication may be too expensive, even with commercial insurance, there may be programs that you can sign up for to reduce the cost. Please contact our office to discuss potential coupons, savings programs, and rebates that may be available for your medication. There are a lot of programs available to receive discounted prices on your medications, so it is ultimately in your best interest to take advantage of them when you can. If you are a current patient, ask for details! If you already have certain medical providers you prefer and want to make sure you’ll still have access to those providers, you’ll want to sign up for a plan that is accepted as an in-network insurance by your provider. If you stay in their provider network, the benefits on your plan will actually apply to your visits and you’ll receive a much lower rate than you would if you went out-of-network. Because a person may see multiple providers and every provider has their own list of accepted insurances, you may run into a problem finding a single plan that is accepted by all of your preferred providers. Or, once you find that plan, you realize it is just way too expensive and cannot afford to sign up, so it is effectively inaccessible. In this situation, you’re going to need to make some type of compromise. You should start by assessing the true cost of the care you expect to receive and focusing on your largest possible expenses first. No matter where the line of “affordability” lies, it is obvious that a PCP visit is at least “more affordable” than an emergency room visit. If you had to pay for one of those yourself, you’d much rather it be the $100 PCP visit rather than the $5,000 ER visit. While you can still manage to incur some pretty significant medical costs with frequent primary care offices and specialists, the out-of-pocket expenses will never be on the same level as a single visit to the hospital. Because primary care visits at Family Care average around $100 per visit if they are not covered, you’d have to have non-covered primary care visits twice a week for an entire year to match the cost of a single accident that landed you in the hospital. Hospital Visits. Just one night in the hospital could cost more than $10,000 if you don’t have insurance, so these visits create the majority of medical debt. Surgeries. A single surgery can sometimes cost more than $5,000 and often requires several costly follow up visits to make sure you are recovering well. Tiered Medications. For drugs that have very specific indications or are considered upper-tier level medications, out-of-pocket costs can be up to $1,000 per month. Because we are dealing with a situation where the insurance company is putting the obligation to pay the claim on the patient, this is basically an extension of our previous discussion on covered services, in general. Being “out-of-network” is one of the most commonly used reasons for an insurer to deny coverage for a particular service, so your plan’s network really has a big influence on your expected out-of-pocket expenses for a certain service. For example, the price of the same EKG at an out-of-network cardiologist could be 500% more expensive than if it were performed by an in-network cardiologist. That is actually kind of crazy when you think about it, but that is for another article. There are a few different ways to find out which providers are in your network. Call your insurance company. There is always a customer service number you can call to speak with a representative from your insurance. Ask them to send you a list of the providers in your area that accept your insurance. Usually, they will either read you a list over the phone, email you PDF file, or direct you to the content on their website. Visit your insurer’s website. Most insurance plans have a “Provider Finder” tool somewhere on their website. Make sure you select the proper choices from all of the possible search filters to ensure that the list actually applies to your plan. Call the provider. Each provider will know which plans they accept, so you could ask them as a starting point. Make sure know the name of the company (eg. BCBS, Cigna) and the name of the specific plan (eg. Blue Advantage, Choice Plus), as both of those are required to verify your coverage. Even if the provider says they accept your plan, you may want to double check with the insurer, anyway, as they will be the ones to ultimately process your claim and make that decision. In order to maximize the amount of coverage you receive from your plan, you should try to stay “in-network” for as many services as possible. Plan to be “in-network” for the big expenses first, because that will make the most difference in your yearly out-of-pocket spending. There are many plans that actually offer pretty good out-of-network benefits, but they will still always be at least some margin less than your in-network benefits. TLDR – A summary of the most important pieces of this article. Your monthly premium is not the only factor you should consider when signing up for an insurance plan. You should consider your total out-of-pocket expenses, which include any copayments, coinsurances, and deductibles associated with the plan you choose. The amount of money you have to pay each year can vary dramatically from one plan to another. You should try to estimate your expected health expenses for the year and find a plan that works for you. You should seek coverage for your highest priced services first, and then worry about the lower priced items later. It is much easier to pay a $100 PCP visit out-of-pocket than it is to pay a $5,000 hospital bill. If you are on medication for a chronic condition, you should ask to see a prescription drug formulary for your prospective plan to ensure that the medication you need will be covered by the plan you choose. You should try to visit in-network providers whenever possible. Going out-of-network can significantly reduce the amount of benefits you will receive from your insurance plan. In order to get a good estimate of your anticipated health expenses, you should check out our Health Insurance Cost Estimator Tool. If you are a current patient at Family Care and have any questions, you should ask Ryan for help! Contact us here. [nextpage title=”VIDEOS – You prefer to watch videos about health insurance instead of reading articles? OK!”] VIDEOS – You prefer to watch videos about health insurance instead of reading articles? OK! Because I completely understand that most people consider insurance to be completely boring and tedious, I tried to select some fun insurance education videos that I thought were actually pretty entertaining. These videos cover similar concepts to what we just discussed in this post and help emphasize the most important point of this whole article – that health insurance can be a good thing that actually make sense and occasionally helps you out, if you know what you’re doing. I hope you learn something that helps you even the playing field and get the most out of your coverage. This is a really cool whiteboard “explainer” video on the different possible ways you could incur out-of-pocket expenses. I think this video does a good job on the concept of out-of-pocket maximums and deductibles, while making you really care for Gina as a person. At 1:59 in the video, I blame whoever was supposed to be spotting Gina on the ladder for that accident. It is also pretty cruel to just leave Gina on the ground while telling her she owes 20% of her medical bill for the fall. C’mon, video guy. This video covers the interesting journey of a beanie-wearing skateboarder that signs up for health insurance and gets into an accident because of a thieving raccoon. The video does a really good job explaining the risk factors involved with not having insurance and understanding the value of staying in-network for services. In the end, you’re actually a little bit upset the hero of the story didn’t learn from his experience when he chases after the raccoon again. You’re gonna get hurt again, dude! Let the raccoon go! For the roughly 2/3 of people who don’t really care about the individual healthcare marketplace because they have health insurance through their employer, this video is for you. This helps explain the reason your premiums rise, or why your employer changes your plan every year to put more of the cost burden on the employee’s out-of-pocket expenses. Most of the time, if your individual contribution is increasing, your employer’s contribution is also increasing. It might not always be at the same rate, but just something to think about so you don’t always have to blame your company for being evil. The video also has a little bit of a “Tron” feel to it, so that is also kind of cool. You’ve probably had enough about insurance for one day, so you deserve a treat. These are goats on a steel ribbon. It is hilarious and mesmerizing and I really wanted the big goat to jump on the ribbon. I like to imagine that big goat jumped up on the ribbon just after the camera stopped recording and he is still there today, happier than all the goats in the land. You can do it, big goat! 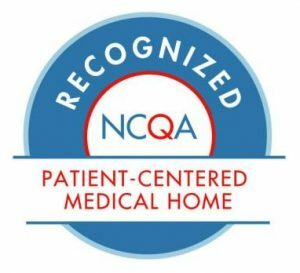 Family Care, PA is a primary care medical facility located in the Durham, North Carolina. We understand that there are a lot of options for primary care in the area, so we know we need to provide a great service if we want to earn your trust. The large local hospitals are still very good, but we think that we provide a special type of care and attention to every patient that is not possible inside such a large system. Here are a few of the reasons we think you would really enjoy having Family Care as your primary care provider. We get to know you personally. Our medical staff and providers take the time to get to know you during your visit, rather than rushing you through your appointment. You will never feel rushed during your visit and will have the opportunity to fully explain your symptoms and concerns. Our administrative staff also takes the time to get to know our patients and works with them to overcome common healthcare hurdles like coordinating specialist referrals, obtaining prior authorizations, requesting medical records, and appealing claim denials. We are great patient advocates. At Family Care, being the best advocates possible for our patients is always our priority. When coordinating care, we always try to work within the structure of your insurance coverage to make sure the process is smooth and you are able to receive the full extent of your plan’s benefits. Our office policies regarding scheduling appointments, payments, and paperwork are all designed to provide the most efficient and affordable care possible. We utilize available technology. Our office is able to provide efficient care by taking advantage of the wealth of technology available in healthcare today. We use an Electronic Medical Records system to manage our practice, which features an online patient portal. The portal provides 24-hour per day access to their own medical records at our office, including appointment reminders, prescription directions, and historical lab results. We schedule 30 minute appointments. Unlike most primary care offices, we schedule each of our visits in 30 minute blocks of time. This does not always mean your visit will actually take a full 30 minutes, but the extra allowance does help make sure you are seen on time for your appointments and still have plenty of room to explain the full nature of your visit and concerns to your provider. We are up front about our policies. We try to make the processes for how we provide efficient medical care as open and transparent as possible so our patients can understand the reasons behind them and why they are necessary, and beneficial, for our patients. We do our best to help patients understand their insurance policies and are always open about expectations, likely possibilities, and potential problems with obtaining coverage in certain situations. Completing this online contact form. 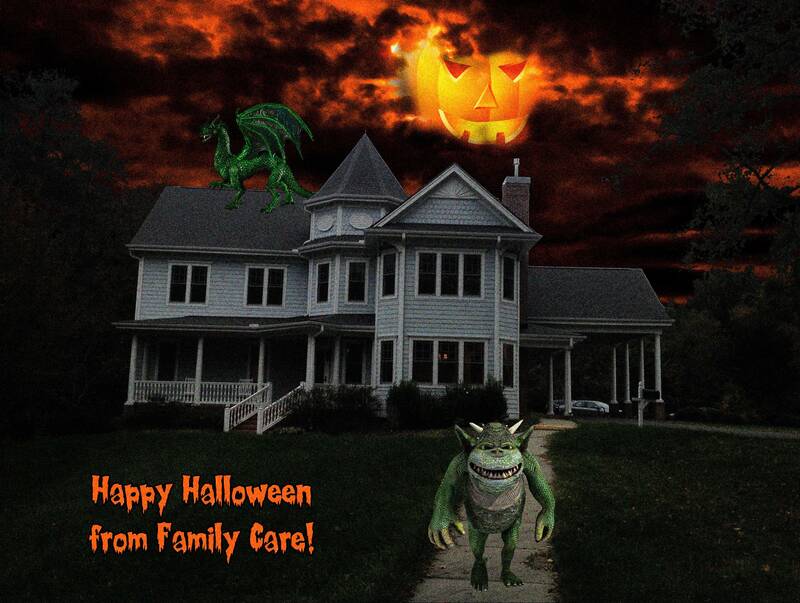 Emailing our office at contact@familycarepa.com. Signing up for our patient portal and submitting a message directly to your provider through our EMR system. Flying a drone to GPS coordinates “Latitude: 35.915967, Longitude: -78.894075″ with your hand-written message. Please print. Note: Mention this option at your next visit and Ryan will give you a piece of candy. We are grateful for the opportunity to take part in your medical care. We understand that you have plenty of options available to you – Durham is the “City of Medicine,” after all. We try to help in every way possible and hope you truly enjoy visiting our office. Thank you for giving us a chance to provide you with great medical care! Influenza is a serious disease that can lead to hospitalization and sometimes even death. Every flu season is different, and influenza infection can affect people differently. Even healthy people can get very sick from the flu and spread it to others. Over a period of 31 seasons between 1976 and 2007, estimates of flu-associated deaths in the United States range from a low of about 3,000 to a high of about 49,000 people. During recent flu seasons, between 80% and 90% of flu related deaths have occurred in people 65 years and older. “Flu season” in the United States can begin as early as October and last as late as May. During this time, flu viruses are circulating at higher levels in the U.S. population. An annual seasonal flu vaccine (either the flu shot or the nasal spray flu vaccine) is the best way to reduce the chances that you will get seasonal flu and spread it to others. When more people get vaccinated against the flu, less flu can spread through that community. Are you up to date on your vaccines? This is our nurse Melissa’s first blog post! Yay! 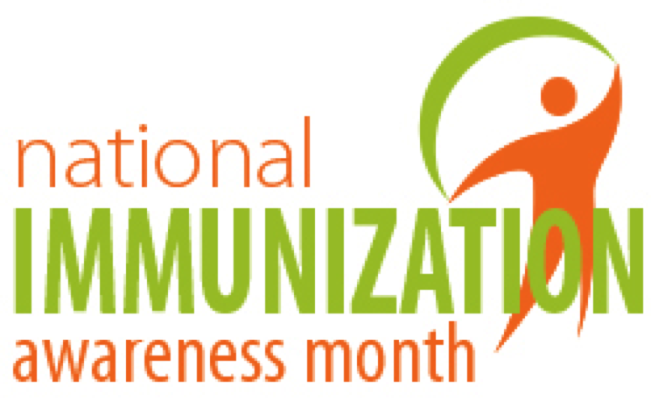 August is an exciting month here at Family Care because August is National Immunization Awareness month! 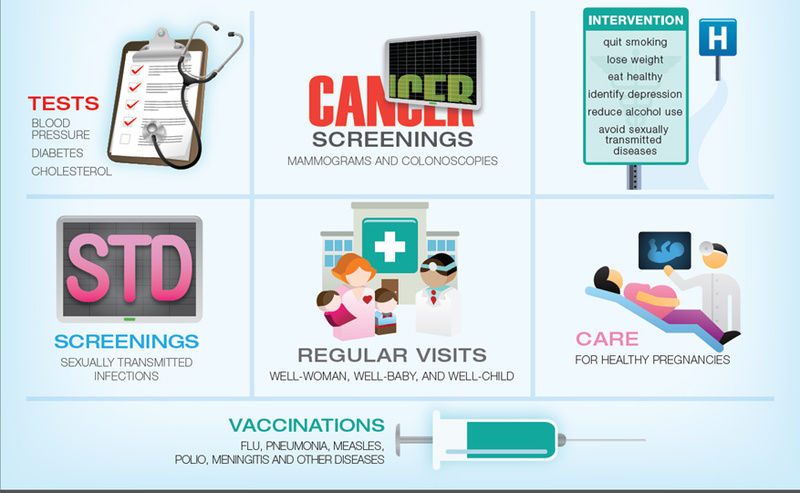 This includes two of my favorite things: vaccines and patient education! I love vaccines so much that I spent three days of my vacation at the Clinical Vaccionology Conference last fall to learn more about vaccines. Once I get started talking about vaccines, why they are needed, and how they work, it’s hard for me to stop. Why do I do get so passionate about vaccines? The main reason is because they prevent diseases and it’s probably the quickest and easiest way to improve your health. There are so many stories of people who have severe complications from diseases that could have been prevented – take polio, for example. Almost every adult over the age of 40 knows someone that was affected by polio but, now in 2016, it’s almost entirely eradicated in all but three countries in the world as a result of vaccinations to prevent the disease. I also enjoy having conversations with patients regarding their fears and concerns about vaccines and giving them the information available to make educated decisions regarding their health. Throughout the month we’ll have different posts that focus on different vaccines and the concerns that surround them. This week, our focus is on adult immunizations. The need for vaccines does not end in childhood. All adults need vaccines based on their age, lifestyle, occupations, travel plans, and medical conditions. Adult vaccinations include Influenza, Tetanus/TDaP, Shingles, Pneumococcal, HPV, and Hepatitis A and B. Each year thousands of adults are hospitalized or die from vaccine preventable diseases. According to the National Public Health Information Coalition an average of 226,000 people are hospitalized due to influenza and between 3,000 and 49,000 people die of influenza and its complications, the majority are among adults. 900,000 people get pneumococcal pneumonia every year, leading to as many as 400,000 hospitalizations and 19,000 deaths. In the U.S., HPV causes about 17,000 cancers in women, and about 9,000 cancers in men each year. About 4,000 women die each year from cervical cancer. All of these incidents could be prevented with proper vaccination. It is not only important for adults to receive vaccines to protect themselves, but also to protect others in the community by preventing the spread of disease to those with weakened immune systems that may be more susceptible to the disease. If you aren’t sure if you are up-to-date on your vaccines, you should contact your healthcare provider today to help protect yourself and decrease the prevalence of these preventable diseases. August is National Immunization Month! During National Immunization Awareness Month, the Family Care blog will be featuring several resources on vaccines and why it is important to stay up to date with all recommended vaccinations, for everyone from children to adults. National Immunization Awareness Month (NIAM) is an annual observance held in August to highlight the importance of vaccination for people of all ages. NIAM was established to encourage people of all ages to make sure they are up to date on the vaccines recommended for them. Communities have continued to use the month each year to raise awareness about the important role vaccines play in preventing serious, sometimes deadly, diseases. NIAM is sponsored by the National Public Health Information Coalition (NPHIC). For more information on the observance, visit NPHIC’s NIAM website. All adults should get vaccines to protect their health. Even healthy adults can become seriously ill, and can pass certain illnesses on to others. Everyone should have their vaccination needs assessed at their doctor’s office, pharmacy or other visits with healthcare providers. Certain vaccines are recommended based on a person’s age, occupation or health conditions such as asthma, chronic obstructive pulmonary disease (COPD), diabetes or heart disease. Vaccination is important because it not only protects the person receiving the vaccine, but also helps prevent the spread of disease, especially to those that are most vulnerable to serious complications such as infants and young children, elderly, and those with chronic conditions and weakened immune systems. All adults, including pregnant women, should get the influenza (flu) vaccine each year to protect against seasonal flu. Every adult should have one dose of Tdap vaccine (tetanus, diphtheria, and pertussis or whooping cough) if they did not get Tdap as a teen, and then get the Td (tetanus and diphtheria) booster vaccine every 10 years. In addition, pregnant women are recommended to get the Tdap vaccine each time they are pregnant, preferably at 27 through 36 weeks. Adults 60 year and older are recommended to receive the shingles vaccine. And adults 65 and older are recommended to receive one or more pneumococcal vaccines. Some adults younger than 65 years with certain high risk conditions are also recommended to receive one or more pneumococcal vaccinations. Adults may need other vaccines – such as hepatitis A, hepatitis B and HPV – depending on their age, occupation, travel, medical conditions, vaccinations they have already received or other considerations.